Outlook 2010 support, new features and improved performance. A new version of the InLoox is now available for download. This new version is a free product update that works together with both 32 and 64 bit versions of Microsoft Outlook 2010. 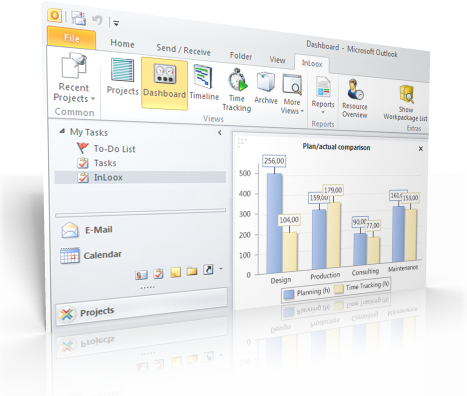 Just like previous versions, InLoox 6.5 is seamlessly integrated into the new Microsoft Outlook. The interface is designed so that the user works only with those functions, which he actually needs. Customers who are still using Outlook 2003 or 2007 will not be forced to adapt to something new – the familiar interface with toolbars and menus is still available. The connection to Microsoft Exchange Server is improved. The InLoox 6.5 is thus a lot quicker, e.g. selecting project contacts from public address books or by assigning work packages in the project plan. The single-user InLoox Personal Edition is outfitted with a more powerful data base driver that speeds up the processing of large amounts of project data. The InLoox server versions are, now, easier to install, as the MySQL and Oracle database installation process has been improved. The report designer has been extended with an improved PDF export, new barcode types as well as a user-friendly print control, which enables simultaneous output to different devices and formats. New features in InLoox 6.5 - InLoox • Copyright 1999-2019 © InLoox GmbH. Reservados todos los derechos.